Enjoy a city full of history! The school is in Prenzlauer Berg, the most fashionable suburb in the city. 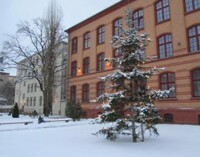 The campus consists of 5 houses that reflect the historical architecture of Berlin. There is an option of accommodation in apartments near the campus, host families or shared apartments a short distance from the center. 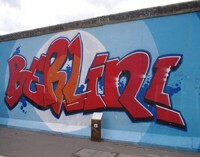 Although Berlin is still under reconstruction, it attracts many visitors for its architectural diversity and great patriotic history – after all it has only been 22 years since the fall of the Berlin wall! 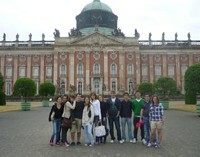 The school is accredited by IALC and EAQUALS and was chosen as the best language school in Germany in 2008 and 2010. This German course allows you to communicate in everyday situations, with activities held after the class. Apartments on campus: Small flats that can be between 23 – 38m2. Each one has a unique style. Every flat is completely equipped and you can opt to stay by yourself or share with two or three people. There is a kitchen, bathroom, free Wifi, telephone, bedding and towels. There is a 2minute walk from the school. Host families: Individual bedrooms, with the security that you will be fully immersed in a German-speaking environment. You can choose to have breakfast or half board (breakfast and dinner). The houses of families are usually between 5 to 50 minutes distance from the center. Washing machines are typically not available but there are some houses that may allow you to use it. Towels and bedding are included. Shared apartments: Individual bedrooms with other international German students. The flats are between 5 to 50 minutes away from the center. Bathroom, kitchen and living room are all shared. Enrolment, informational material, proof of your progress from when you start to the end, and an accredited final diploma. Transfers to and from the airport and medical and travel insurance not included, please inquire. 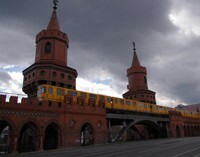 There is public transport direct from Berlin and Hamburg airports. Berlin-Schönefeld airport is 24km southeast from Berlin and Tegel airport is the main airport in the capital. Both have buses to the city center. A large social and cultural activity programme (some included in the price whereas others are upon registration).